Front Room is proud to present “Strata,” featuring the photographic works of Zoe Wetherall and Ashok Sinha. 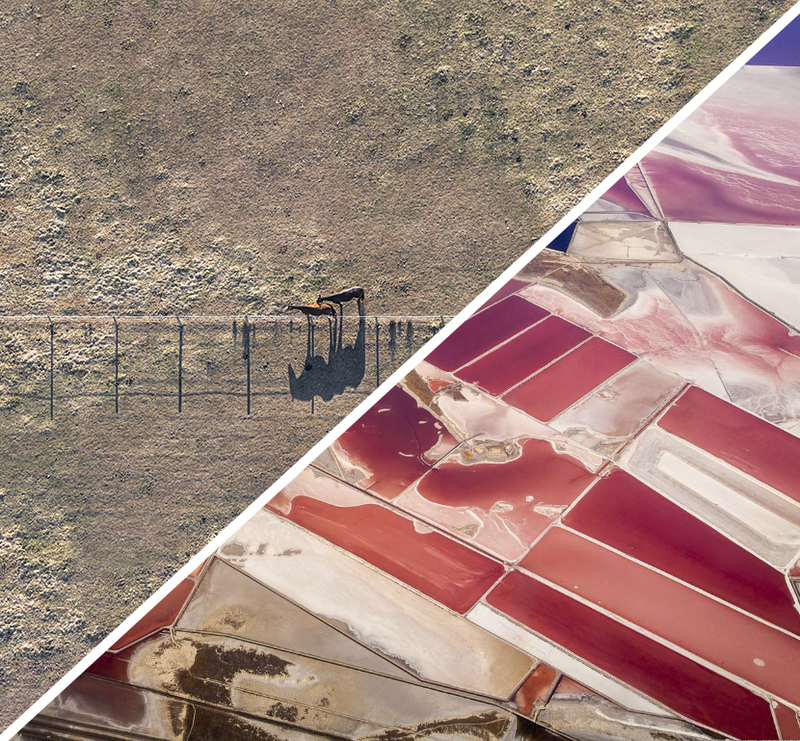 Both artists employ unique methods and get uncommon results for photographing aerially—Sinha’s atmospheric photos from the passenger seat of a commercial airline, and Wetherall from the basket of a hot-air-balloon. Aerial photography actually got its auspicious beginnings before airplanes and helicopters in 1858 when Gaspard-Félix Tournachon (known as “Nadar”) first mounted a tethered balloon in Paris with a large format camera. Things have been photographed from rockets, satellites, pigeons, you name it, but mostly nowadays they are taken from chartered helicopters and drones. In the two person exhibition, “Strata,” Wetherall floats hundreds of feet gently above us in a balloon, while Sinha is soaring thousands of feet up in a jet airplane with scores of other passengers, who are unaware of his photographic exploits. In Ashok Sinha’s series “New York to Los Angeles,” Sinha manages to capture the beauty and abstractions of the landscape below that often go unnoticed by millions of travelers every day. In this ongoing series, shot during commercial flights Sinha continues to take on cross continental trips between the two cities he does not use any special photographic equipment in making these images, except using a specific technique to shoot through airplane windows. Although he is selective when choosing airlines' specific flight routes and seat assignments, he only shoots during extremely short timeframes during a typical flight, and a lot of this work depends on a fair amount of trial and error, weather conditions, and sometimes just plain luck. Ashok Sinha is a New York-based photographer. His photographs have been exhibited at The Museum of the City of New York, the International Center of Photography, and The Royal Photographic Society. Zoe Wetherall’s photos are taken just above us, a bird’s eye view. From a few hundred feet Wetherall photographs straight downward, excluding the horizon, sky, or any visual reference point. Her photos tell stories and inspire questions: in “Horses” two horses stand next to a wire fence, the shadows of the fence posts and horses delineate their forms on the ground–tell us what they are–in an otherwise brown field of texture. In another photograph a wavy line of bushes separates finely mowed grass from a dense blue water, carefully manicured, and refined–but what is it? She records the structured geometry of natural and man-made forms and uses her camera to reveal the beauty in the subtle patterns hidden in architecture and landscape. Zoe Wetherall is a Brooklyn-based photographer from Australia. She has won numerous photography awards in Tokyo, Moscow, New York, Los Angeles, and Australia, and others.